There is no doubt that a good hobby can leave you feeling happier and less stressed out. Since the UK now loses millions of working days every year due to stress, getting a hobby that relaxes you is pretty much essential these days. What better way is there of reducing your stress than by sewing at home? Of course, the fact that this is such a useful thing to do as well means that it is usually an easy decision to start it up as pastime. You can save money as well as delighting friends and relatives by making lovely clothes for them from scratch. There can be few more satisfying hobbies than that of producing garments that you are proud of. Overlockers offer a terrific way of getting professional finishes every time. It can take a bit of time to get used to operating one of these machines but the best overlockers around in 2019 give you a tremendous amount of flexibility and adaptability when it comes to sewing all sorts of garments. If you’re in a rush, make use of our quick link table below. This 3 or 4 thread overlocker from the respected Brother brand is a feature-packed device that comes with an instructional DVD to make it easier to get started with. The Brother M343D Overlocker uses the F.A.S.T lower looper threading system and provides LED daytime light for your comfort. You get a free arm / flat bed convertible sewing surface and tension disk release that guarantees that you always have precise thread placement in tension disks. The differential feed means that you can produce perfect seams and overlock stitches on just about any kind of fabric, which makes it a highly versatile and useful machine. You can use normal sewing machine needles with this device. The width of the stitch can be effortlessly adjusted using the slide lever feature. As for the length, there is a simple dial adjustment for that too. The Brother M1034D Overlocker is a 3 or 4 thread overlocker that includes the Blind Stitch Foot, Gathering Foot and Piping Foot. As with many of the best overlockers, it can be used on a free arm or flat bed basis for greater flexibility when you need it. It is mains powered and is rated as 230 volts and 100 watts. With features such as easy to follow lay-in threading and the F.A.S.T lower looper threading system, you can effortlessly produce whatever type of seams and stitches that you need every single time. Complete beginners can take comfort from the fact that it comes with an instructional DVD showing them exactly how to get going. You can then use it on just about any type of material with perfect results. 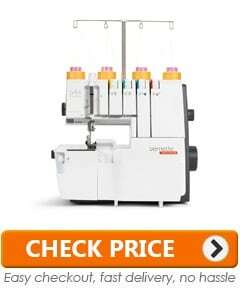 The versatility of the Brother 3034D Overlocker means that it is perfect for sew-&-cut overlock stitches. This is a 3 or 4 thread machine that has a differential feed and free arm flat bed. With thread twist protection system and an instructional DVD, this is a nice package that should suit the majority of users perfectly. You can sew seams, trims off any excess fabric and overlock the raw edges effortless in one simple step using this device. As you would expect, you can convert the sewing surface between free-arm and flat bed as necessary. This quality overlocker comes with a carry handle that makes it extremely portable. It weighs 7 kgs. 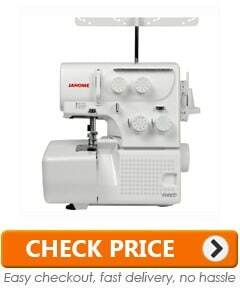 The Janome 9300DX Overlocker is a quality overlocker that comes with an excellent range of features and accessories. 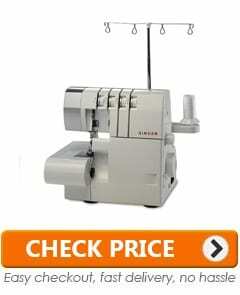 It can be used for 3 or 4 thread overlocking thread overlocking and gives you a great deal of versatility. The differential feed ratio is 0.5 – 2.2 and it allows for precision stitching for the perfect end results every time. This is a compact overlocking machine that is also sturdily built and very quiet when it is in use. It comes pre-threaded and also includes a built-in rolled hem for the highest quality finish. It is definitely worth watching the instructional DVD that comes with this machine. In this way you can learn all about the many ways you can use it, and how easy it is to get professional results. 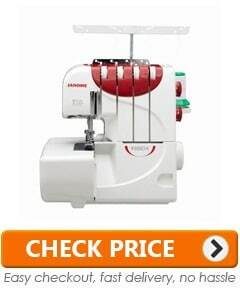 As with many of the best overlockers, the Janome 8002D Basic Overlocker Serger can be used with either 3 or 4 thread options. It is also easy to use thanks to the colour coded threading. With a 4mm stitch length and easy rolled hem conversion, there is a lot to like about this overlocking machine. Among the good points is a low price that makes it a good starting point for anyone looking to give an overlocker a try for the very first time on a tight budget. Despite the low price, there are a lot of useful features on here, which means that it is worth taking some time to try and understand them all. A couple of the features worth mentioning are the built in rolled hem and the differential feed. 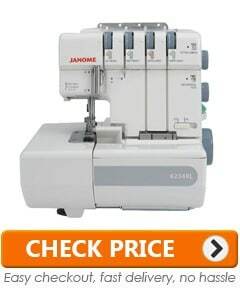 Anyone who is happy paying a little more for one of the best overlockers on the market should definitely take the Janome 6234XL Overlocker into consideration. One of the aspects that helps it to stand out is the fact that it offers 2, 3 or 4 thread overlocking options. The seam width can be set at between 1mm and 5mm. The seam length can be set to narrow (3.3mm) or wide (7.5mm). As for the adjustable cutting width, this ranges from 3.1mm up to 5.1mm. Some of the features on this Janome overlocker that are worth mentioning are the differential feed, the lower looper pre-tension setting slider and the Changeable thread guide. It is clear that a lot of thought has been put into making that a top class machine with a ton of useful features. 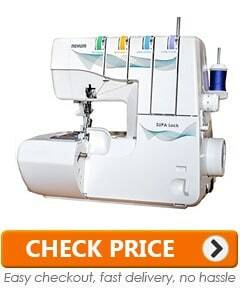 This Singer overlocker is another great machine from the ever popular sewing machine brand. The Singer Overlock 14SH754 Sewing Machine can help you to get a brilliant finish on all of your sewing tasks every time. 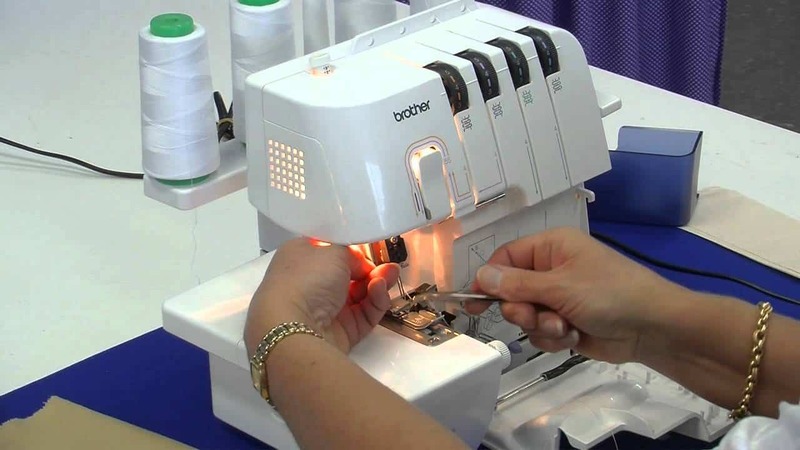 It is a 4 thread overlock with 4, 3 2 stitch configurations and differential feed that lets you make adjustments to get the exact edge that you need. 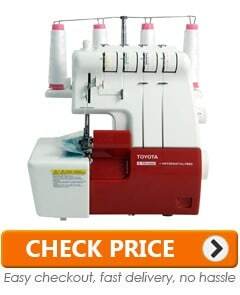 As with most of the best overlocker machines, you can adjust the stitch length and width very easily. It also comes with colour coded threading paths and loops to make your life easier. This is also a great option for saving time when you are in a hurry to get finished, as it can do up to 1,300 stitches per minute. With this Singer overlocker you also get a good range of accessories such as needle set, tweezer, spreader and screwdriver. The versatile and easy to use Jaguar 486 Overlocker can be used as a three or four thread overlocker. 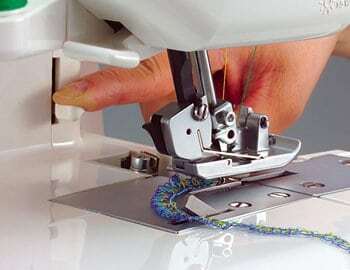 One thing that helps this model to stand out is the unique easy threading system; it is the only overlocker around that has a 180 degree threading mechanism that fully opens so that you can easily get to the looper thread guides. There is also a colour coded threading guide as well, to make sure that threading is always fast and simple with no specialists tools needed. The clear dials that are mounted on the front make the changing of stitch width and length a piece of cake. This Jaguar overlocker comes with the essential accessories that you need, such as stitch finger, needle threader, needle set, screwdriver and moving cutter. 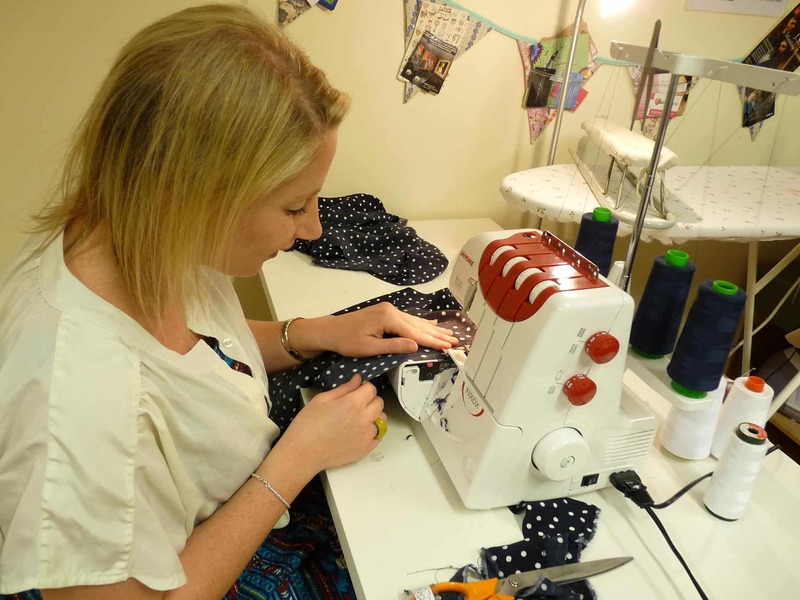 It can take time to get up to speed with your first ever overlocker but this is one of the easiest machines of this type to get started with. The Bernina Bernette B44 Overlocker Machine is classed as a suitable option for beginners who want to get started as smoothly and effortlessly as possible. It includes 15 stitches and gives you the option of 2, 3 or 4 overlock stitches, so it can handle a huge variety of different tasks. The stitches can be adjusted to anywhere between 3m and 7mm for great flexibility. The maximum sewing speed of this machine is 1300 stitches per minute. It comes with a bright LED light for good visibility. Getting started is easy too, as the coloured markings make it incredibly simple to thread the looper and needle without any hassles or frustration. 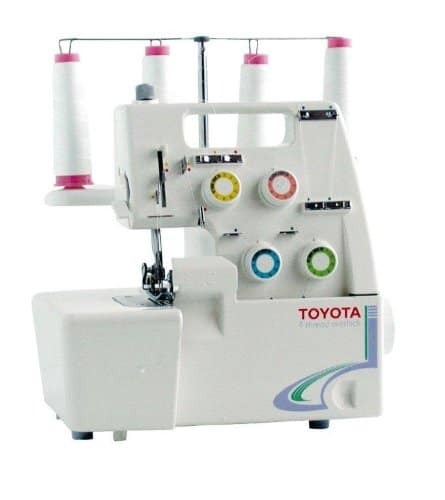 Creating professional seams is made a lot easier when you use the Toyota SLR 4D serger with accessories. 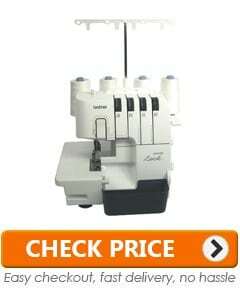 This is one of the best overlockers in terms of value for money, as it provides an excellent article at a great price. It gives you the option of a stitch length of 1mm to 4mm, as well as a cutting width of 3.1mm to 7.3mm. The device features an electronic foot controller, colour coded threading and the option of flatlocking. 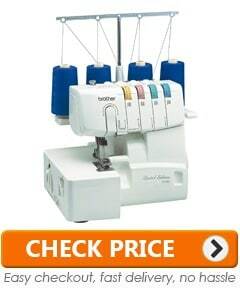 You can with 4 or 3 thread overlock functions, while there is also a wide option with the 3 thread approach. Some users have mentioned the fact that threading is a bit trickier than would be ideal, although it does seem to be a question of getting the hang of it more than anything else. Overlockers are a type of sewing machine that is ideally suited to making a tough seam while finishing the edge of the garment professionally. These are versatile devices that allow the user to create terrific finishes on many different types of fabric. While the machine does all the work for you, it is still good to know how it forms the stitches that you ask it for. Basically, the needle enters the fabric you are working with and then makes a loop in the thread. The needle then carries on down and a lower looper will come across it and pass through the loop that has been already made in the thread. The lower thread than passes through the path of the lower looper while an upper looper arrives to pick up the lower looper thread and the needle thread. At this point both loopers go to the side and needle drops down, behind the upper looper. The end result is a strong and durable seam. A good overlocker machine will give you the option of a massive different types and finishes, so that you have something perfect for every occasion. Many of the top overlockers around appear to be very similar at first glance. Yet, the truth is that even differences that appear minor at first can make a huge difference to you in the long run. The following are some of the most important features that you should look out for when choosing a new overlocker. The number of threads. This is the easiest way to see how many different stitches you can make with a particular overlocker. Many of the best overlocker machines will offer the choice of 3 or 4 threads, but these stitches can run from a single thread up to 5. Generally speaking, the higher the thread count the stronger the seam will be. Stitching speed. 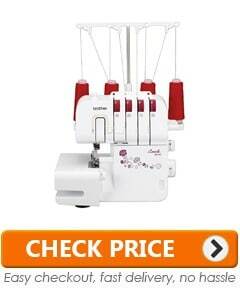 A fast machine will obviously let you get through your sewing tasks more quickly. This is ideal if you working professionally, with many people who sew as a hobby not quite so bothered about how quickly they could finish each garment. The threading mechanism. You might think that threading your overlocker to get started is going to be the biggest challenge. Well, the good news is that most modern machines have colour coded treading system that make it a lot easier. A good LED light. Are you likely to need an overlocking machine with a good LED light? This is probably the case if you plan to work with it at night or in a room that doesn’t receive a lot of natural sunlight. Instructions. If you are a complete beginner then you will want to get a machine that comes with good instructions. In many cases, this now means getting a DVD that you can watch to find out the basics. Ideally, it will also have an instruction booklet that you can flick through whenever you need to. How easy it is to adjust. You might want to adjust the likes of the stitch width or the stitch length. In this case, it is important that you can do so easily and effortlessly. This is especially true if you plan to work on a variety of different garments or just like the idea of experimenting with a number of alternative finishes. Portability. Are you planning to use your overlocker in a fixed location or might you want to take it to different places now and then? Getting a light but sturdily built machine will make it a lot easier to carry it around, while some even include a free bag to transport it in. Free arm / flat bed convertible sewing surface. This feature is something that will make your life simpler when you sew smaller, round items such as kid’s sleeves. Buying the right overlocker could give you the ideal way of starting up a brilliant new hobby that gives you a tremendous amount of pleasure in the years to come. Meanwhile, making the wrong choice could leave you frustrated at not being able to work with it as effectively as you want to. Therefore, why not take a few minutes to consider your needs and wants? After this, you can look through some of the best overlocker models that might suit you and make an informed decision.